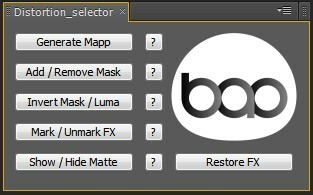 BAO Distortion Selector 2 gives you new control over distortion effects: the zone affected by distortion! Define areas with Masks and/or Luma matte. CS6 & CC users can use the new Feather mask tool to get really accurate control. Upgrade notice: If you purchased the previous version you will get a discount equal to 100% of what you previously paid, you only need to pay the difference. Make sure you login (or create a new account) with the same email address that was used for the original purchase. Please contact support if you have any questions.